read John 4. Flirting is fun but it has a dark side. We’ve all seen the aging actresses who look like caricatures – applying too much make-up in a vain attempt to recapture the days when men whistled when they walked by. But is this problem restricted to aging actresses? Or is it all too easy to become dependent on our ability to seduce others; to think we’re nothing unless we’ve got suitors; to be so eager to please, we lose sight of ourselves? Is this the kind of thing someone like Jesus understands? Have a look at these words of Jesus to the woman at the well: “You’re right when you say you’re not married. You’ve had five husbands and the man you’re living with now is not your husband.” Anytime we’re tempted to think the Bible isn’t relevant, passages like these remind us that it’s far more relevant than we care to admit. You can almost hear the flap of her eyelashes as she compliments the Son of God. You can’t blame her. She probably only has one way of relating to men – trying to seduce them. It is significant that when she returns to her village she says that Jesus has told her “everything she’s ever done” – that’s probably because in her eyes, seducing men is all she thinks she’s ever done. 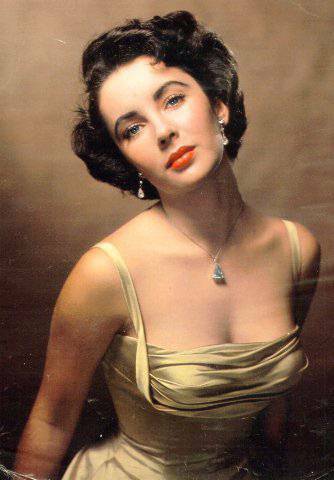 She’s probably good at it; the five husbands suggest she was an Elizabeth Taylor in the making. She might have once been beautiful. She might still be beautiful. She might have had an absent, abusive or distracted father and have spent the rest of her life trying to get her father’s attention through seducing other men. She might have had a critical mother. Who knows. There are many pathways to becoming the woman at the well, but it only leads in one direction: a constant thirst for more empty adulation. No wonder the woman at the well responds when Jesus tells her: “those who drink the water I give will never be thirsty again. It becomes a fresh, bubbling spring within them, giving them eternal life.” John 4:14. This woman knows what it is to be thirsty. We all want a life in which we have something we can count on to feel “good.” We want a life with a fresh bubbling spring within us, on which we can draw anytime we thirst. We don’t want to be dependent on things outside ourselves. But if feeling good is dependent on the reaction of other people, we will always live in insecurity. Like vampires, we will always thirst for more. If seducing is our game – whether literally, or just getting people to smile when they see us, or to say, “beautiful” when we walk by, or to turn a head – we can never rest. Two texts are never enough – we need four. When we get four, we need eight. One date a week feels like a failure. When we have two dates, we wonder what to do the other five days. Being dependent on the reaction of others is just another form of addiction. The woman is “surprised” Jesus talks to her because she’s of a despised race. John 4:9. The disciples were “shocked” to find him talking to her because of her gender. John 4:27. But when we see this woman’s addiction, we shouldn’t be surprised. Jesus calls her “dear woman” – but it’s not because he buys into her seduction game. It’s because to Jesus, no matter how many husbands she has had; no matter how many men she has lived with outside of marriage; she is “dear.” He loves her in a way no man has ever loved her, or could ever loved her. Jesus loves her in the way she has always wanted. He loves her because He is love. And so Jesus reveals His identity to her. He removes His fig leaf, as it were – to a person of a despised race and gender. He tells her “I am the Messiah.” Removing your fig leaf is the very definition of intimacy. Why does Jesus tell her who he is? He gives her Himself for the sole reason that she wants Him. He satisfies her because she is thirsty. Her thirst meets His provision because that’s what God does. The woman at the well thirsts for true intimacy – and so she gets it. She’s removed a lot of literal fig leaves in her life, but this is the kind of fig leaf we really want – Jesus removes His mask. When this chapter opens we see Jesus in his full humanity: He is “tired” from his long walk. He sits “wearily” beside the well. It is “noontime.” But the moment the woman at the well affirms her faith in the coming of the Messiah, Jesus reveals himself as fully God. It is, in its own right, a kind of personal transfiguration. Jesus takes off his humanity and reveals himself as the Son of God to a lonely woman living with a man not her husband. In other words, Jesus “gets his shirt wet” here. He puts his words into action. He has said on the Sermon on the Mount: Blessed are those who “know” their need of God, for the Kingdom of Heaven is theirs. Matt. 5:3. Blessed are those who are “hungry” now, for they shall be “satisfied.” Here he meets someone who knows her need of God: “I AM the Messiah.” John 4:26. In revealing Himself to someone who says she is looking for the Messiah, He lets her “see” God; he satisfies her hunger by giving her Himself. The woman goes running. She tells everyone in the village those haunting words: “come and see.” John 4:29. The people come “streaming” from the village to see him. They beg Jesus to stay, and after listening to him for two days they affirm: “Now we believe, not just because of what you told us, but because we have heard him ourselves. Now we know that he is indeed the Savior of the world.” John 4:42. This is the evolution for every believer – we hear the testimony of others; we go to see for ourselves; and then we have our own experience of the living God; we “know” He is the Savior of the world. The experience of coming to faith, in other words, is a kind of “seduction” – a completely satisfying one. We hear, see and taste for ourselves the “goodness” of the Lord – and we are hooked. But unlike other forms of seduction, which steal our identity because we become dependent on something outside ourselves – this seduction restores our identity because it fills us from the inside out. God gives us the love we’ve always wanted but have never been able to find in our fellow humans. The key to the difference between God’s love and all other kinds of love lies in Jesus’ first words to the woman at the well: “Please give me a drink.” John 4:7. The words are a foreshadowing of Jesus’ words on the cross: “I am thirsty.” John 19:28. God became thirsty so that we would never thirst again. The reason God can fill us is because God took on our emptiness. He thirsted so streams of living water could flow form our hearts. He experienced thirst on the cross, in order to satisfy us. He went to hell so we could go to heaven. And through thirsting, Jesus is able to restore us to satisfying relationships. The moment the woman at the well meets Jesus, she returns to her village, and is received positively. Later in the chapter, the father who believes when Jesus tells him to go home to find a healed son – he “and his entire household” believed in Jesus. When we enter into true intimacy with Christ, we discover that He enables us to have more intimacy with the humans around us. The new intimacy comes not through seducing them with our own charms, but through sharing the love of Christ – a love that is a “just because” love. We find a new intimacy that comes not through masking our imperfections with charm, make-up, fluttering eyelashes, easy compliments and seductive undertones, but that comes despite our own imperfections. The intimacy comes through sharing the grace, mercy and love of the only Perfect One. We begin to learn how to lay down our pride. We become, in a very real and profound sense, brothers and sisters with those who share this love. We find in Christ, and through Him in others, the love we’ve always wanted. We dip into a well that runs deeper than we can fathom, a well that will fill our every bucket to overflowing, so that we discover we need to find new buckets because our old ones break from the overabundance of fresh, bubbling, exciting, satisfying, consuming, giving, receiving and fulfilling love. This entry was posted in John and tagged buckets, Jesus, John 4, living water, New Testament, seduction, thirst, vampires, water, well, woman at the well by Caroline Coleman. Bookmark the permalink.